Of course, I’ve eaten Shropshire Blue before. I knew I had because I grew up in Staffordshire, the neighbouring county. We used to shop over county lines in Market Drayton and Shrewsbury so obviously I’ve eaten Shropshire Blue. So, this is one of those moments when I’m reminded that I know bugger all about cheese. Probably more than your average Joe, I’ll give me that, but really, bugger all. Now, I don’t feel too bad about knowing flip about flocculation or being an affinage amateur. And I’d never heard of Norwegian Brown Cheese or Idiazabal or even Perl Las until the last couple of months. And I’m fine with that. But recently I found out that…pauses to put on the big cap with ‘CD for Cheese Dunce’ on it and retires to the corner in a puddle of shame…Shropshire Blue has nothing to do with Shropshire. A blue, pasteurised cow’s milk cheese, Shropshire Blue really does sound like an historic British cheese, that was maybe developed in the shadow of Housman’s ‘blue remembered hills’, but in fact it only came into existence during the twentieth century and was created in the shadow of some substantially bigger hills, up in Scotland. There are two stories as to how Shropshire Blue came to be. One has it that a Cheshire cheese grader called Dennis Biggins created it in the 1930s, by adding the colouring annatto to what was essentially a Stilton cheese. But others say that it originated in the 1970s at the Castle Stuart Dairy in Inverness, an invention of Andy Williamson who had trained in Stilton-making in Nottinghamshire. Back then the cheese was named ‘Inverness-shire Blue’ or ‘Blue Stuart’ but it’s fair to say it wasn’t an immediate success. It seems hard to imagine anything Scottish being a marketing failure in these days of David Tennant, call centres desperate for recruits with ‘the nation’s second favourite accent’ and the entire output of CBeebies seemingly set in the highlands and islands. If I was promoting a cheese these days, I’d be summoning my very tenuous family links to the McNaughtons and slapping a picture of a sporran on the packaging as quick as you like. But back in the 1970s, Scotland just didn’t seem to have the same pull (let’s face it, The Krankies aren’t anyone’s idea of brand mascots) and so they changed the name to Shropshire Blue to make it sound like an old English cheese. And, ever since, countless mugs like me have fallen for it. The Castle Stuart dairy closed down in 1980 and after several false starts, the cheese is now made by most Stilton makers, including Long Clawson in Leicestershire and the Cropwell Bishop and Colston Bassett dairies in Nottinghamshire. 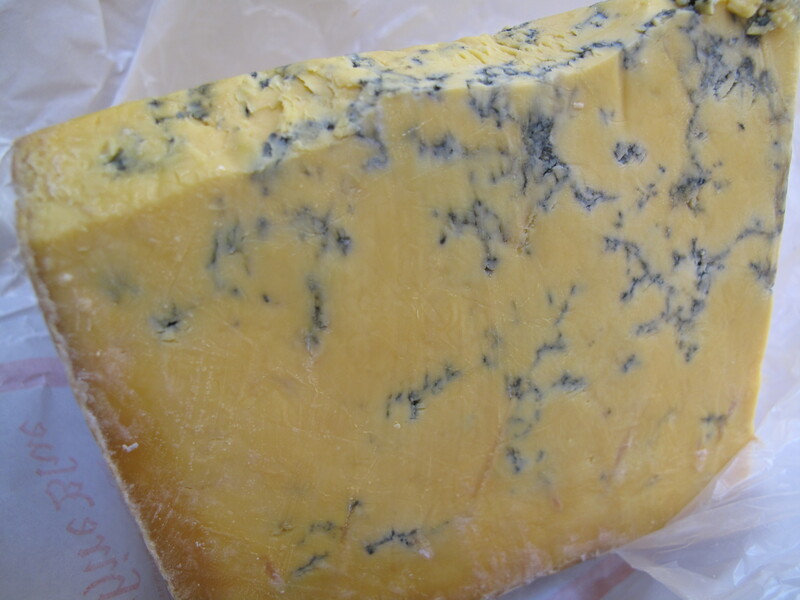 And finally, a type of the cheese, Ludlow Blue, is being made in the county of Shropshire by the Ludlow Food Centre. (I’d love to claim that it was this variety that I was weaned on but alas I think they only started production a lot a few years after I grew up). And how does it taste? Well, like a good quality Stilton, it’s creamy but with a sharp tang of blue running through it. It tastes a bit different to Stilton though; there’s a je ne sais quoi about it, it’s a bit more caramel-y and sometimes I swear even a tad spicy. Right, it’s back to the cheese books for me to get swotting up. Now, Edam really is made backwards, isn’t it?..